I suppressed a smirk, as the book was Walking in Mallorca by June Parker, updated by Paddy Dillon. He looked confused, but when I directed him to my name on the cover and my photo inside, he understood and left the book on the table. I grabbed my pack, ready to climb a mountain. I think the look on my face must have told her she’d made a grave mistake! Busted! I admitted that I was and she called to her three friends, and told them to bring the guidebook so that I could sign it. They couldn’t find it, so I directed them to the table where the Dutchman had left what was evidently their missing book. They were climbing the same mountain as me, so now they had the guidebook and the part-author for company. It was way back in the 1980s that June Parker researched and wrote Walking in Mallorca, and following her death I had been keeping it up-to-date. The 1980s were a long time ago, and things had changed dramatically in Mallorca. Routes that June walked freely had become forbidden to walkers, while other areas, formerly very jealously guarded, had been purchased and made available to walkers. As for signposts, they were springing up everywhere, indicating both long-distance and long-forgotten paths through the mountains. It was time for a complete overhaul. 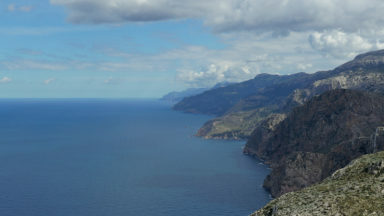 The first thing I do before visiting Mallorca is contact my friend and mountain guide Jaume Tort. 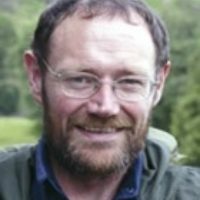 He is always bang up-to-date about paths that have just been opened or closed, or those that are overgrown or have just been restored. Jaume is also the driving force behind Editorial Alpina’s impressive map coverage of Mallorca. The first time I ever walked on the island, the old military and IGN maps I was using were desperately bad, but I had no alternative. Jaume had just started work on the first of several new maps, and I was stunned by the level of detail. In recent years I walked and re-walked the long-distance GR221, steering Trekking in Mallorca through two editions and, with Jaume’s intervention, Editorial Alpina graciously provided their detailed mapping of the route for the latest edition. 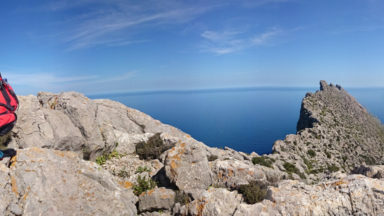 When a completely new guidebook was requested, called Mountain Walking in Mallorca, it was my cue to visit the island yet again. As always, I got in touch with Jaume to see what wisdom he could impart and we arranged to go on a few walks together. The mountains of Mallorca are made almost entirely of an incredibly thick layer of Jurassic limestone, heavily weathered back in a time when the rainfall was considerably heavier than today. There are steep, sheer and often overhanging cliffs, massive boulders and heaps of scree and rubble, deep and dark gorges, and what I would call ‘man-eating terrain’. Seriously, the ground often feels as if it’s got teeth, and there are places where you could fall down a crack and never be seen again. The ruggedness of the ground underfoot isn’t always apparent, as there are dense holm oak forests that conceal all manner of pitfalls and trip hazards. Deep and dense grass, known locally as càrritx, catches first-time walkers to Mallorca unawares. It looks innocuous from a distance, but when one foot treads down on the grass, the other foot often gets caught while swinging forward, risking a fall. A couple of trips and you learn to start high-stepping through it. For me, spring is the best time to walk in the mountains of Mallorca. Winter tends to be wet, with a risk of snow on the higher mountains, but when spring arrives there are green shoots and colourful flowers, even in the rockiest places. With the summer heat, everything starts shrivelling and turning brown, and walking becomes quite exhausting. I had a vague plan for exploring the mountains, which was to start in the west and work my way east through the rugged Serra de Tramuntana. 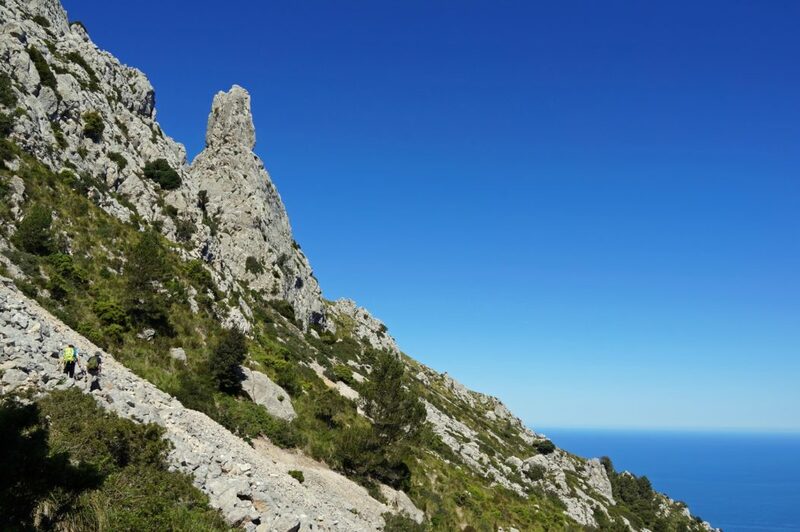 This designated World Heritage Site is a formidable mountain range stretching all the way across the northern part of Mallorca, home to mountains that often exceed 1000m. 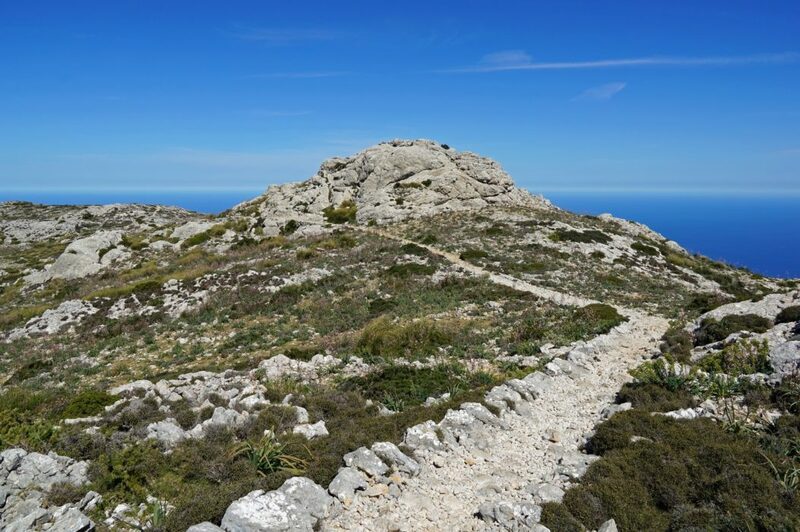 I gave myself the easiest possible start, traversing the dragons-back island of sa Dragonera, which just involves following old roads and tracks linking three lighthouses, but the highest point of na Pòpia is very definitely a mini-mountain. Not all mountain walks have to reach a summit. Often, it’s great just to be in the mountains, where following old mule paths to interesting places can prove more entertaining than fighting through desperate terrain just to ‘bag’ a peak. As I worked my way through the mountains I included village-to-village walks via rugged mountain paths. When lofty and popular peaks presented themselves, such as s’Esclop and Galatzó, I would tackle them from all directions, taking advantage of new access that had been provided in the past few years. It was a delight to look at paths and tracks that had recently been re-opened, after being closed for a dozen years, above the village of Banyalbufar. On a previous visit, I was actually the first person through gates that had been locked for years, finding a newly signposted network of trails beyond them. While checking routes above the historic village of Valldemossa, I explored an area where access for walkers is subject to a permit system, introduced to limit the number of walkers while important conservation work is accomplished. 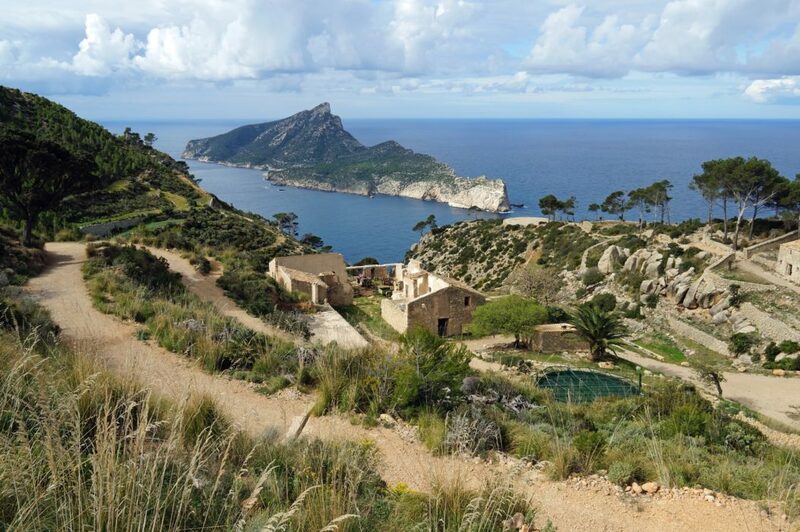 This kind of land and access management scheme is being watched with interest by a number of mountain estates in Mallorca. A previous landowner and Hapsburg family member, Archduke Ludwig Salvador, had an excellent path constructed along the mountain-tops that is a very popular walking route today. 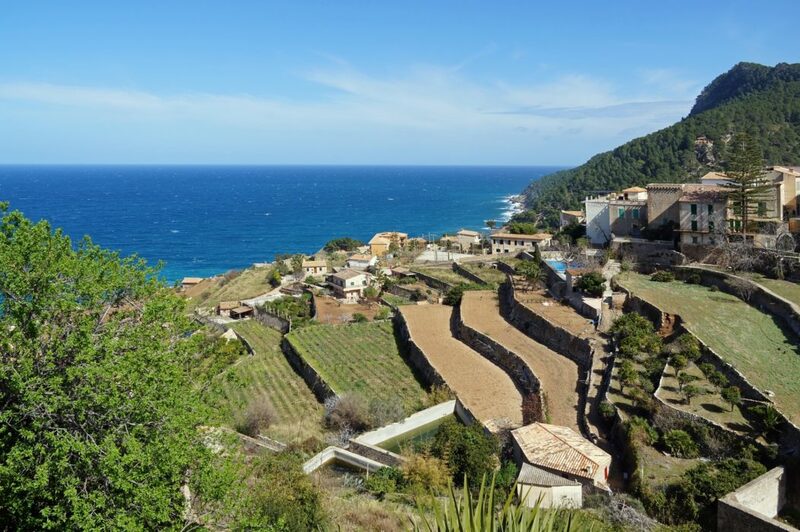 Deià and Sóller are both popular locations, boasting a network of signposted walking trails. 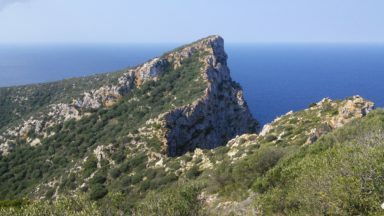 There are exceptionally rugged coastal walks, several easy old mule tracks and cobbled highways, and access to some particularly rugged mountain walks that require stamina and determination. 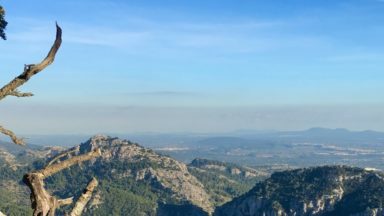 The Serra d’Alfàbia and Puig de Bàlitx feature some very awkward terrain that simply can’t be rushed. Cúber and Tossals Verds lie well away from towns and villages, among mountains threaded with paths and tracks that range from easy to very difficult. 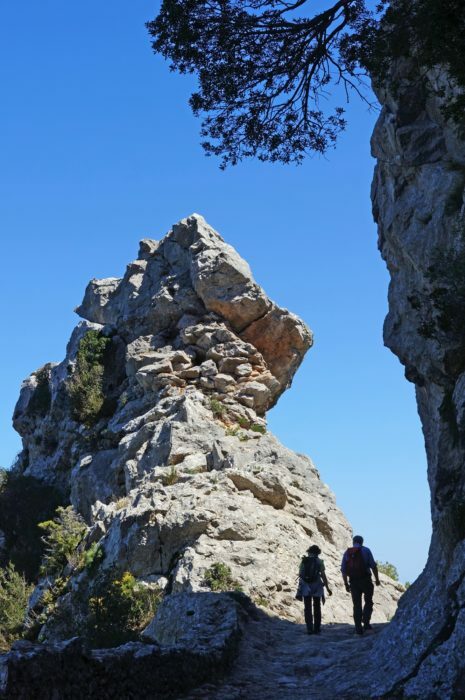 In some places, such as the Coll de l’Ofre, it is possible to switch from one route to another mid-walk, or switch from a circular walk to a linear walk, ending far from your starting point. This approach is to be encouraged, but if you can’t arrange a pick-up, then be sure to have up-to-date bus timetables for bailing out at the end. All towns and villages in the mountains offer accommodation, but the monastic complex at Lluc offers renovated monks’ cells surrounded by awesome mountains. Lofty Puig de Massanella, Tomir and other mountains can be climbed from here, as well as a very scenic circuit of Puig Roig, although this last one is available only on Sundays. 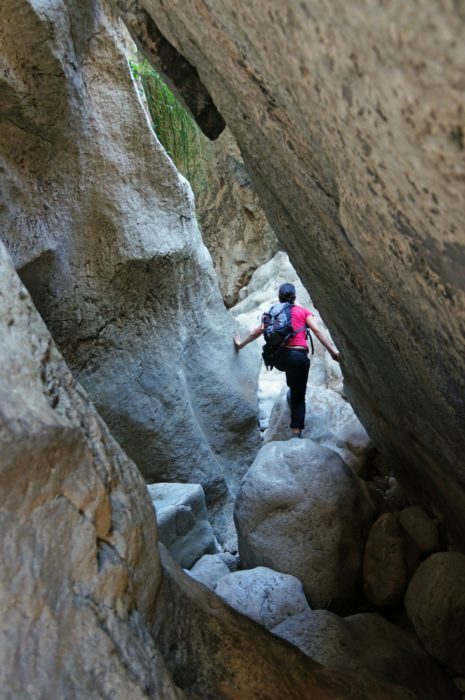 There are paths to and from the village of Caimari that are well worth discovering and, with very careful planning, a descent through the deep and dangerous Torrent de Pareis could be considered. 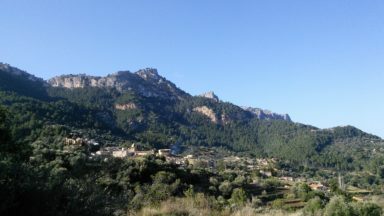 My friend Jaume introduced me to a mountain called Puig de n’Ali, telling me that no visiting tourists ever climbed it. The summit was a remarkable jumble of huge boulders quite unlike anything else on the island. There was a visitor book on top and all the names in it were Mallorcan. Jaume got me to sign it, adding a note to the effect that this was the first recorded ascent by a foreigner! 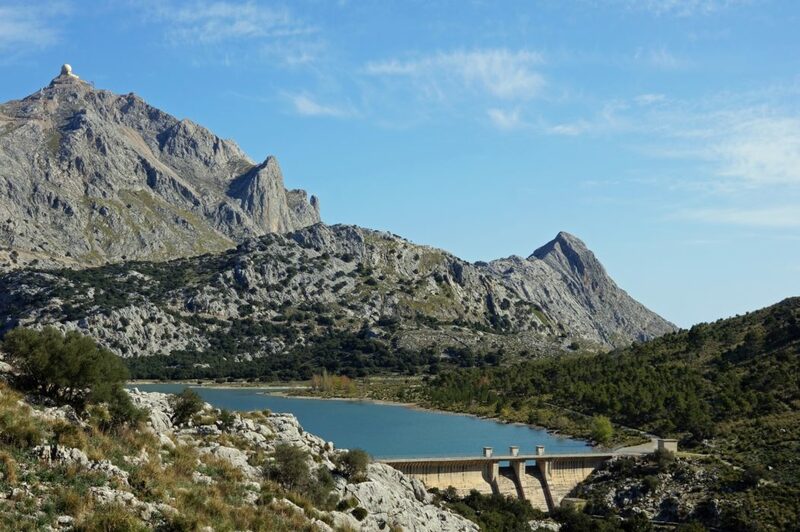 There is an old mountain highway linking Lluc and Pollença, known as the Cami Vell. 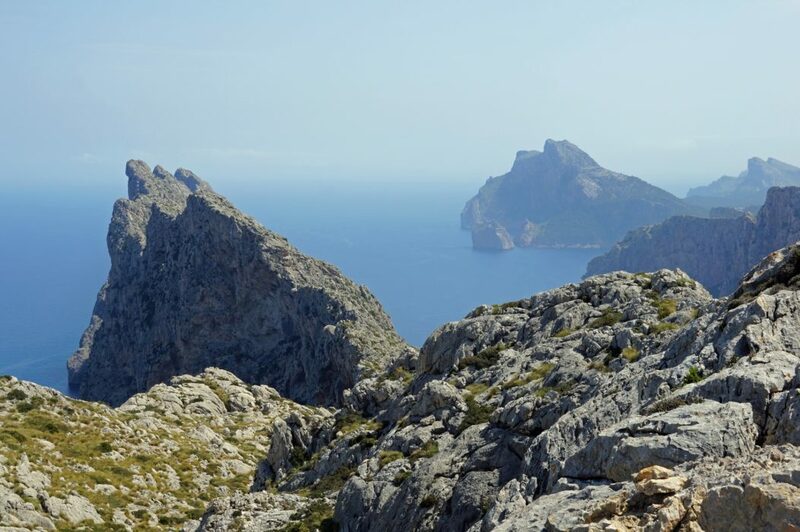 From the steep-sided little mountain of Puig de Maria, above Pollença, mountains can be seen stretching eastwards, out onto rugged peninsulas at Formentor and Alcúdia. 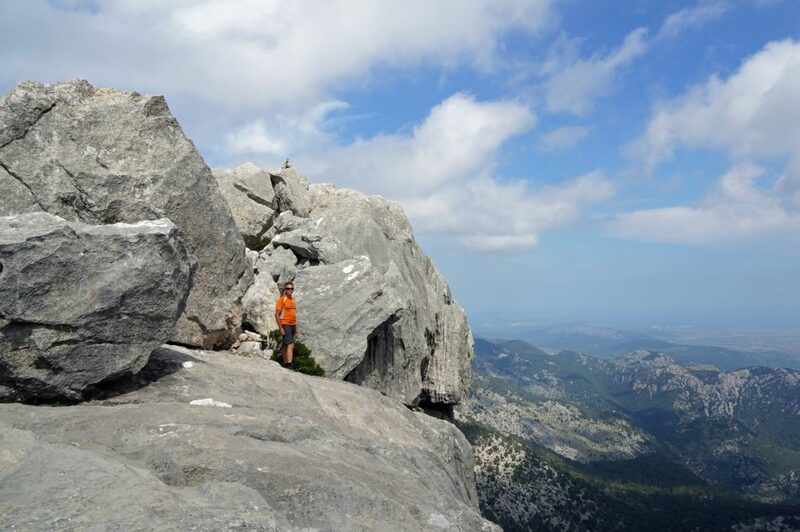 For those who are very agile, with steady feet and a good head for heights, the traverse of the Serra del Cavall Bernat beckons, but more cautious explorers should avoid this and head for a handful of smaller and more accessible mountains. Editorial Alpina, whose excellent maps cover all the mountains of Mallorca, offered the use of their maps in Mountain Walking in Mallorca, so readers have the best mapping available, overlaid with detailed route lines. 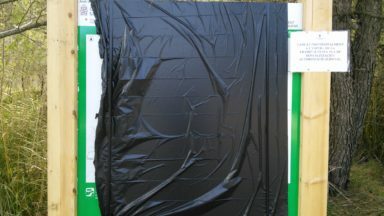 Readers will see walkers using these maps throughout the mountains, and they are widely available around Mallorca. Having accompanied my friend Jaume as he delivers these maps by the box-load to shops, hotels and other businesses, continually re-stocking as the season progresses, it’s clear that they are very highly regarded.